After a few days of no answer there, I figured I should post what's been going on over here in the forums. Hello all. Big, big fan of your hard work and determination, ayufan. The first few times I attempted to get to the IP, the screen loaded blue but nothing else. After it timed-out, I tried a Ctrl+F5 (clean refresh), and it loaded even less this time. I did the usual troubleshooting: let it run for awhile, then reboot - no change; tried the other image for OMV on Rock64Pro - no change. I just came back, again, plugged it in. Nothing different. Nothing at all. The SAME error messages occur, but this time the web interface works. It even times me out (as it should) when I'm not active. So, that's weird. But is it functional? My issue is, if the unit says the firmware isn't loading, should I try using it? As well, did I choose the incorrect images? Did I miss a step? Clicking the download link revealed (either because it's an old link, or because it's the version that is known to work) that it downloaded version 0.7.8 instead of the 0.7.9 I had already. I will work on this and update as I discover more. Ugh. No joy. Does exactly what 0.7.9 does. users are provided both of the Stretch versions ("armhf" and "arm64" for 0.7.8), and a (previous, I'm guessing?) third Jessie version, named/version "0.5.15-136". I haven't tried the Jessie version, nor the "arm64" of version 0.7.8. I think I'll also try unplugging the PCIe card (using the Pine64-provided PCIe-to-SATA adapter), since a few sections in the forums suggested it in various troubleshooting attempts. Those "error" messages are "normal" at the moment - they certainly are not preventing anything working on my setup. Indeed I have no idea what they relate to. (09-06-2018, 01:36 PM)kuerious Wrote: [ -> ] ... why, oh why, did the Pine64 team NOT include a power button on the power supply? There's no chance to press the small board button after you plug it in - it just boots. Leave it plugged in and use the power button on the board? I too have the same error message on the OMV console. I don't think it is effecting anything but I do have a streaming issue to LibreElec causing freezes. I don't think they are related but I cant rule it out at this point yet. Well, it seems that it's an errant error message. I will say that, from off to the end of initial boot-up, it sure takes its time. But once its up, it's speedy. This is what I was hoping for buying this particular equipment. Still have yet to initialize my HDDs. It's a shame I can't use a full 2280 eMMC alongside them ... it'd sure make caching better. But that's what a 6-core/4GB AIO board is for, amirite? Quote: Those "error" messages are "normal" at the moment - they certainly are not preventing anything working on my setup. Indeed I have no idea what they relate to. On my rp64 with pcie-nvme card i have these messages. [email protected]_0:~$ dmesg | grep -E "cdn-dp"
My sys is running fine. No errors with my Samsung 960 EVO. Search for "rockchip/dptx.bin", the following page is found. 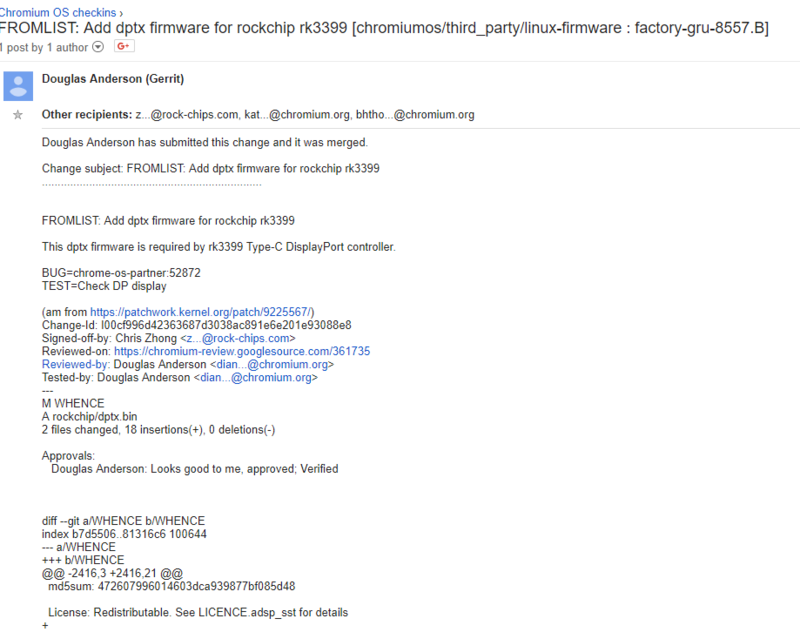 "rockchip/dptx.bin" seems to be a firmware for "Type-C DisplayPort controller driver". Is it using "Type-C DisplayPort" instead of "HDMI-Port" for monitor connection? I think I found** the permanent fix for this particular error message. After digging around a LOT of forums in regards to the filename (dptx.bin), I found not only the original commit in 2016 for this file in a chromiumOS forum (see this post) and where it belongs (see this post), but I also traced it down to what the file's purpose is (listed below). I was also able to find the actual dptx.bin file necessary to make the problem go away. This was done in both Debian and Ubuntu images from Ayufan. Quote: This series patch is for rockchip Type-C DisplayPort controller driver. The USB Type-C PHY is designed to support the USB3 and DP applications. (PD) is accomplished using a PD PHY or an external PD chip. Version 1.3, This IP is compatible with the rockchip type-c PHY IP. and link training, the host use mailbox to communicate with the ucpu. I'm even going to attach it, in case the repo goes bye-bye. But basic instructions are as below. Now, on reboot, the error messages go away. I'm so surprised that it worked, I swear I did something wrong. Critiquing is welcome. Thanks for reading. (01-16-2019, 03:18 PM)kuerious Wrote: [ -> ] I think I found** the permanent fix for this particular error message. While this is some good detective work I personally wouldn't be using a random binary blob from the net. I especially love that the "commit" was the blob itself. Sure supposedly it's firmware so a binary blob is likely all we would get regardless but why is not available with appropriate checksums from Rockchip?